positioning of all the counties are clearly specified in the county map of Connecticut. 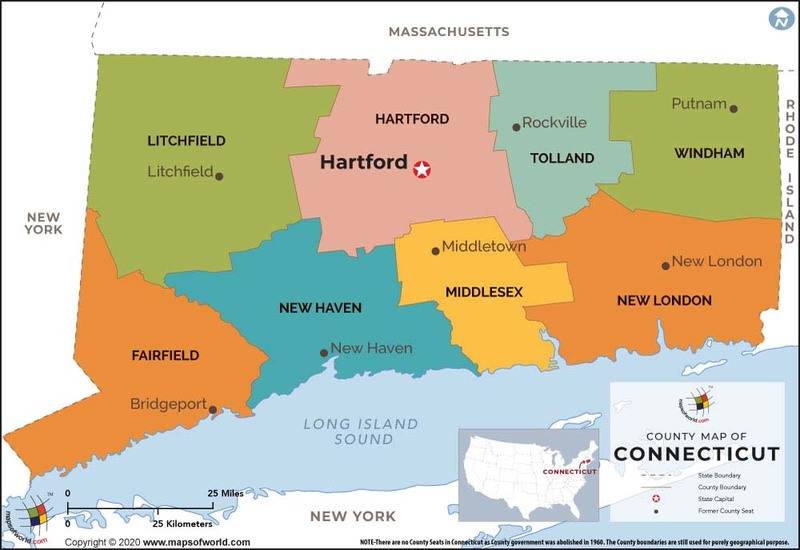 Tolland, Fairfield, Windham, Middlesex, Litchfield, New London, Hartford and New Haven are the counties of Connecticut. The county seats of all the Connecticut counties were permanently abolished in 1960. At present, the counties of Connecticut are sub-divisions of the state. Being founded in 1785 Tolland county of Connecticut has a total population of 136, 364 (census 2000). Fairfield county in Connecticut covers an area of 626 sq miles and has a population of 882, 567 (2000 census). Windham county was established in 1726 and 109, 091 is the total population. Middlesex county founded in 1785 has a total population of 155, 071 (census 2000). Litchfield county spans over an area of 920 sq miles. New London County in Connecticut occupies a total area of 666 sq miles. Hartford county with a population of 877,393 (census 2005) was established in the year 1666. New Haven county extends over an area of 606 sq miles and accommodates a total population of 824, 008, as per census 2000. The Connecticut state map is a vital indicator of all the counties of the place.